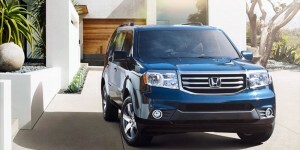 When it comes to vehicles in the full-size SUV segment, like the 2013 Honda Pilot, there’s no doubt that Orange County drivers are looking for a vehicle that can help them do more while still helping them save money. While for other automakers that might necessitate some level of compromise, it doesn’t when it comes to the Pilot. Featuring a powerful engine, efficient mileage ratings, a comfortable interior, and an attractive price tag, here at Middletown Honda we think the Honda Pilot promises to be the better buy, even against segment rivals like the 2013 Ford Explorer. There’s no doubt that Honda’s popular SUV is designed to offer a better cabin experience than the Explorer; being a larger vehicle, the Pilot offers more hip room and shoulder room for passengers in all three rows than the Explorer, as well as seating eight people, while the Explorer can only seat seven. Passengers in the Pilot will also appreciate the vehicle’s standard dual zone climate control, which isn’t available on the Ford. Orange County drivers can experience the advantage for themselves firsthand when they schedule a test drive at Middletown Honda; contact us to see how you can get behind the wheel of this amazing SUV today!